Asphaltphobia? Acute wanderlust? Compulsive cornering? This brochure can help! We showcase a sporty, off-road trike, a communication-friendly touring tandem, and a fun-loving trike for everyday use. The delta trikes in this brochure have no age restrictions. What they do have is the Steps. This Shimano motor supports muscle power during pedaling, the two rear wheels provide outstanding stability, and the stylish looks draw lots of attention. It’s like three bikes rolled into one: the PINO STEPS. A semi-recumbent tandem that, with the right accessories, can be transformed into a cargo bike or a family taxi. And it comes with an e-motor for that extra “oomph” when you need it. With all this versatility, why even bother with a car? With their cool and sporty designs, HASE BIKES’ adaptive trikes for kids don’t look anything like a typical therapy tricycle. And they certainly don’t ride like one. 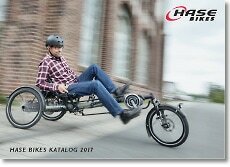 In this brochure, you can also read about how a semi-recumbent tandem can offer new opportunities for fun family adventures.